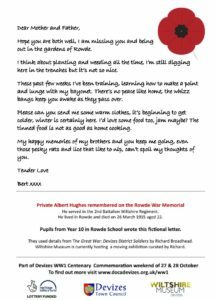 The featured letter is that of Albert Hughes, and was written by pupils in Year 4 (children aged 8-9) at Rowde School. Around Devizes, you can now see fictional, volunteer letters inspired by factual information about soldiers from Devizes who fought in the Great War and are commemorated on the Devizes and Roundway War Memorial. The inspiration for the stories came from the information in Richard Broadhead’s Book The Great War – Devizes and District Soldiers. You can find them in the following locations in the town – see if you can read all of their stories. The letters will be taken down after Armistice Day on Sunday 11 November. Albert Hughes Market Square between Corn Hall and Winkworth’s estate agent on a finger post. William King On a lampost by the Market Cross. Bear Hotel side. William Mead Sheep St – opposite the Library. Charles Sainsbury Bottom of Long Street by Town Hall on fingerpost by flowerbeds. Samuel Slocombe Opposite hospital sign on Commercial Road/ New Park Road roundabout. Walter Weekes On corner of Snuff Street by Costa Coffee in Market Sq. Horace Withers By Police Station on New Park Road on National Express timetable post. Read all the letters by downloading this PDF file (388k). 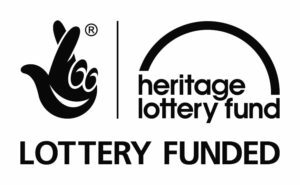 Part of the Wiltshire Remembers project, supported by the Heritage Lottery Fund.